Speaker of the House Steve Harshman (R-Casper) speaks to reporters on the first day of the 2018 session. On February 22 a group of Torrington’s Trail Elementary School students visited the Wyoming Legislature. Schoolchildren from around the state frequented the House and Senate galleries throughout the recent budget session. From high school government classes taking notes to elementary students marching in neat lines down the hallways, Wyoming’s youth came to Cheyenne to witness their Legislature in action. And though they didn’t all realize it, the core of that action was a battle over public education funding. The images of young faces watching through glass partitions as solons on the other side argued over their future were striking. Lawmakers honored the Torrington students’ visit — as they did each school group that paraded through — with a floor announcement by the local legislator and a standing ovation by the body. When the Torrington students were introduced, Speaker of the House Steve Harshman was toward the back of the chamber, taking a break from the dais to circulate amongst the representatives. When the applause ended, he came out and introduced himself to the students’ teachers, but not as the Speaker. 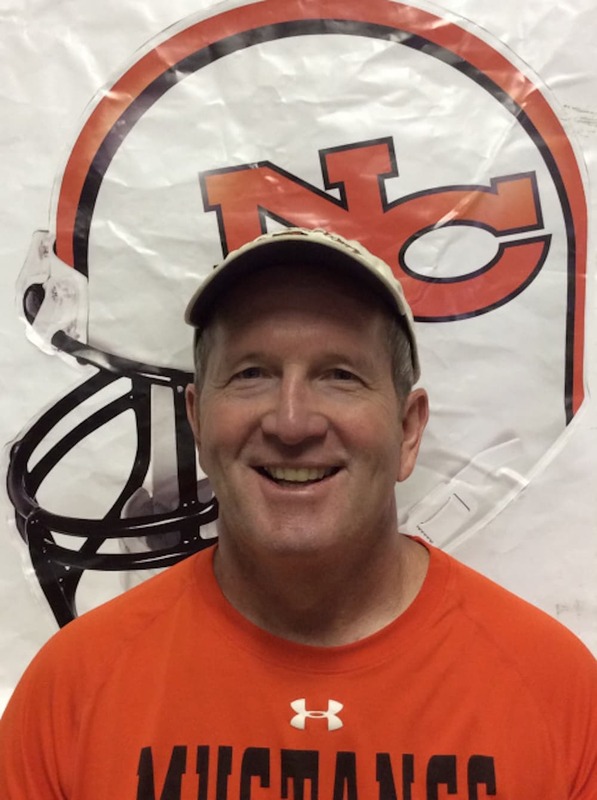 Harshman didn’t mention that he is also the head coach of the Natrona County Mustangs football team, and has been for 27 years. Also omitted was that for five weeks from mid-February to mid-March, Harshman was almost certainly the single most important public school employee in Wyoming. Supporters say Harshman wore that mantle well. He stood up to the Senate, they argue, and forced a third avenue into a conversation over education funding that had been dominated by binary alternatives: steep cuts or a monstrous tax increase. Critics say Harshman’s clear bias for education led him to protect schools at the expense of other legislative priorities and perhaps jeopardize the state’s future financial health. Some scoffed at the coach with the “aw shucks” political demeanor who doggedly asked again and again how Wyoming will use its considerable wealth now that the energy industry can no longer be counted on. Many lawmakers entered the session largely in agreement that Wyoming faced a $900 million dollar “structural deficit” between revenues and expenditures. With little political appetite for raising new revenue through taxes, only spending cuts appeared to be on the table. Senators in particular eyed education funding, which made up around $660 million of the deficit, as the place to make them. Harshman wanted to reframe the primary assumptions of the situation. In a state with $20 billion under investment, he argued a “structural deficit” was in part a fault of the structure. 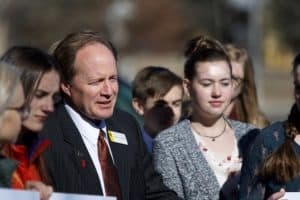 With that premise in mind he went looking for money that could be shifted from its current structural obligations to cover the costs of Wyoming’s public schools and he rallied House members behind his ideas. Few doubt that he succeeded to a certain extent. Though education took $27 million in cuts, many senators and some members of Harshman’s own chamber wanted far more. They did not get it. At the same time, through tinkering with a complex system of revenue streams the House pushed through changes that could provide sustainable funding for school construction and maintenance, a significant part of the funding hole. Was it a masterpiece of offense and defense that saved Wyoming’s public school system from catastrophic cuts? Or is the new approach a flawed trick-play that, as critics contend, obscures but does not solve the funding deficit and makes the state more vulnerable to future market downturns? Time will be the ultimate judge. In the meantime, WyoFile examines the Speaker and the solutions he shepherded through the Legislature. Harshman extolled the virtues of “teamwork” and “hard work” so frequently during the five-week budget session that at times he seemed almost a caricature of a gym teacher. But in the midst of a showdown with the Senate, the “team” in “teamwork” often extended only to his own chamber. 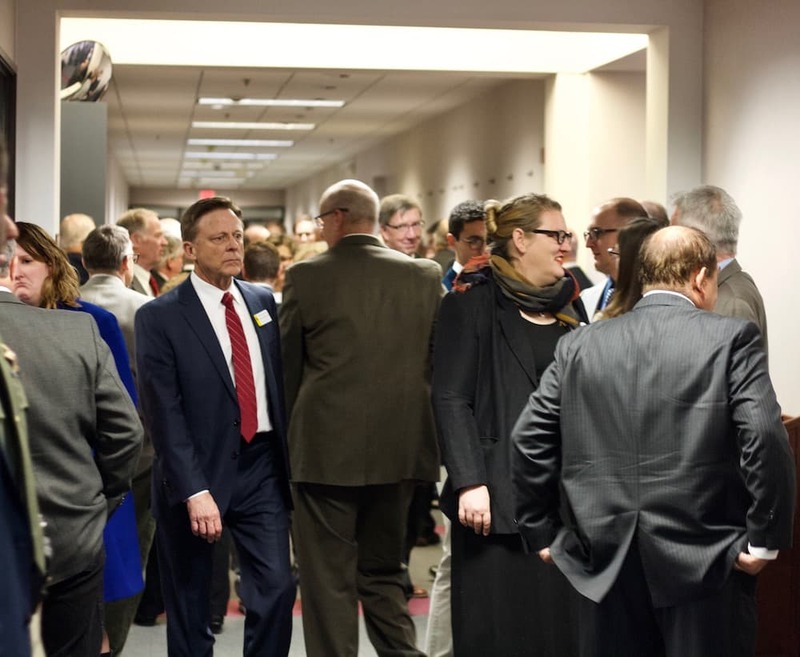 By the session’s conclusion, observers and lawmakers worried about a lack of collegiality in the Legislature — not between Republicans and Democrats as in other states, but between the House and Senate. Such toughness may come naturally to a politician who was an all-conference offensive lineman in college before dedicating the bulk of his career to the gridiron as a coach. But even Harshman’s critics agree that he was in many ways uniquely qualified to serve as Speaker during a time of thorny fiscal questions for the state. And not because of his coaching experience. Harshman spent 10 years writing budgets on the Joint Appropriations Committee and served four as the committee’s chairman. Few lawmakers know the budget as well as he does, colleagues say. Harshman came to the session with a vision for how the state could assuage some of its fiscal troubles, Sommers said. The Speaker then worked to align his chamber behind him. 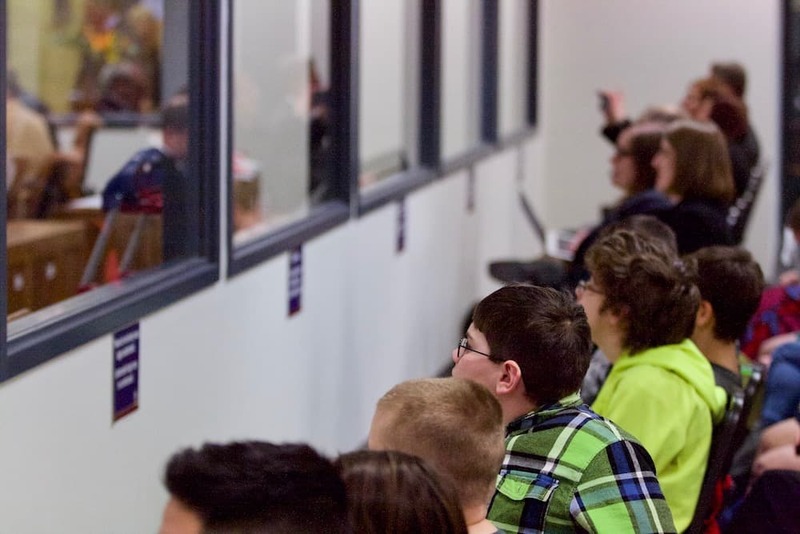 Speaking with the Torrington teachers in February Harshman repeated a frequent lament of his; that these students were visiting the legislature when it was in its temporary home at the Jonah Business Center — a glass-plated former K-Mart in a busy commercial district. Renovations kept lawmakers and visitors from their gold-domed capitol building downtown, built in the late 1880s and home to the Legislature since statehood. Senators often voiced exasperation with the House, where bills that appeared uncontroversial or likely to pass suddenly touched off hours of debate, clogging up the overall process. Other bills never got heard at all. Particularly irking, said Peterson, the senate revenue chairman, was the House decision to adjourn early on the first Friday of the session — the last day for legislation to be introduced. Closing up shop at 3:30 p.m. left a wealth of bills to die, including many tax increases and a number of measures that committees had spent months working on between sessions. Harshman was roundly criticized for the early departure, both by House Minority Floor Leader Cathy Connolly (D-Laramie), who was upset by the lack of consideration of any tax bills, and by conservatives who saw bills on social issues die. “There was no rhyme or reason” to it, Peterson said. Observers lamented the lost hours further when, the following week, the House got bogged down in budget amendments debate. The Senate, with only 30 members and rules about limited debate, moves through its docket more efficiently. Not so in the House where lively debate is unlimited and a group of conservatives — reminiscent of Washington D.C.’s “freedom caucus” — often makes up for its lack of voting power with passionate speeches. While the Senate considered 73 amendments to the budget bill, the House debated 113. Many came from the House’s conservative caucus as members sought to bring cuts both specific — sell one of the state’s two jet airplanes, for example — and broad — lower the amount of money the state pays into government employee retirement plans. Other amendments weren’t cuts at all, like an attempt to force the state fire marshal to implement a fire safety code for food trucks. Budget amendments receive a voice vote with shouted “ayes” in favor or “nos” against. But many times the votes were too close for Harshman to call, forcing a count and taking even more time off the clock. On Wednesday, Feb. 21, the House worked until after 10 p.m. The last amendment of the night came from Connolly, who tried to get at least one new source of revenue through the chamber. Her amendment would have raised the state controlled price of liquor 14 cents a bottle — generating $6 million a biennium for school construction, she said. Small-government conservatives, frustrated at how few cuts to government they’d passed, berated the idea. “I guess it’s fitting that we’re ending with booze since we’ve been spending like drunken sailors all day long,” said Rep. Bo Biteman (R-Ranchester). The amendment failed. Harshman’s ability to maintain support for his initiatives — many key measures on education or changes to revenue streams passed with 45 votes or more — in a body that could disagree on even slight points for hours on end impressed some. Peterson said even if he didn’t agree with some House ideas this session, he was impressed by Harshman’s ability to rally support behind them. 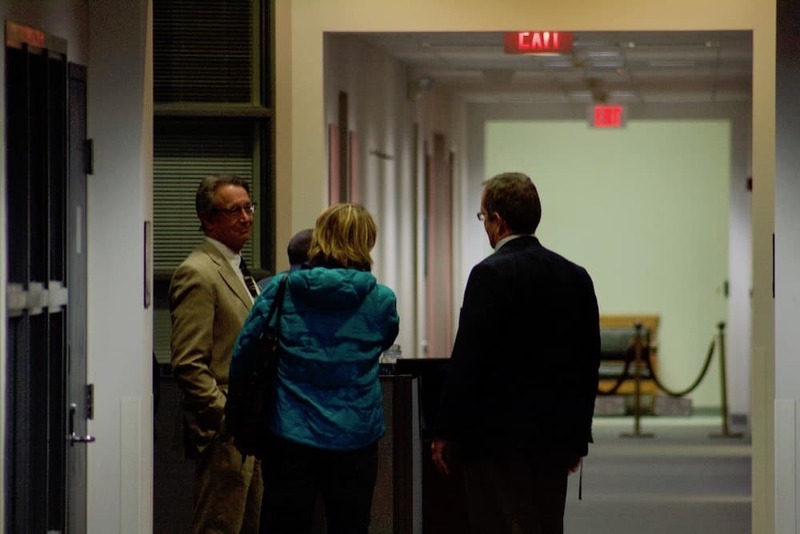 Senators may have been frustrated by the pace of the lower House, but in Harshman’s weekly meeting with reporters he described the long night as a highlight. “I think Wednesday was probably one of the best days I’d ever seen in the House of Representatives,” he said. Except, of course, he was quick to note, the fact that it took place in the Jonah Business Center. That disappointment aside, it was clear to him that the House was becoming a unit. But how exactly was hard for Harshman to articulate. 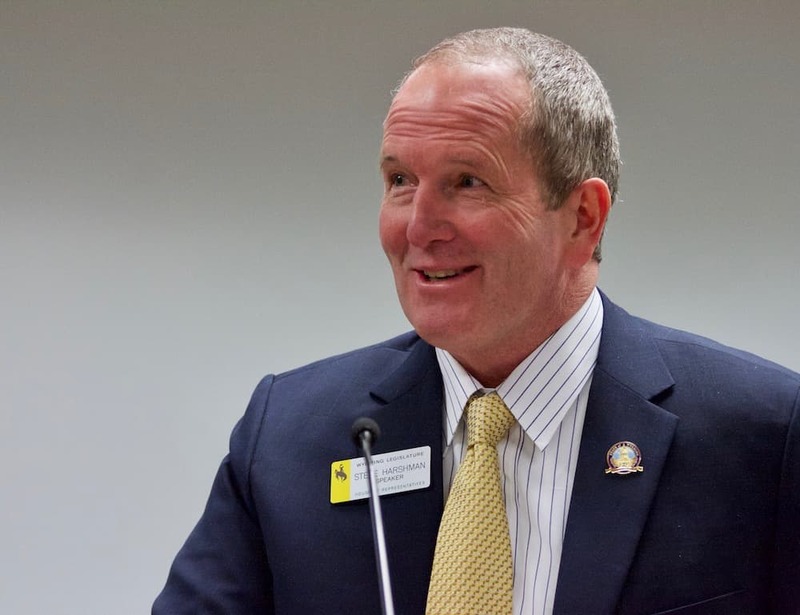 There is an established progression to leadership in the Wyoming House. Traditionally, the Republican caucus elevates the Majority Floor Leader into the Speakership. When Speaker of the House Kermit Brown retired from the Legislature in 2016, Rosie Berger of Sheridan was the Majority Floor Leader and had served 13 years. Tim Stubson of Casper was the Speaker Pro Tempore, second in line in the traditional hierarchy. That August, Berger lost her primary election to Biteman — the lawmaker who accused his colleagues of spending like drunken sailors. 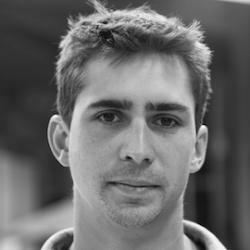 Biteman was one of several newcomers who knocked out House incumbents during an anti-establishment wave that accompanied the 2016 presidential election. Stubson meanwhile left the Legislature to pursue a failed bid for U.S. House against Liz Cheney. 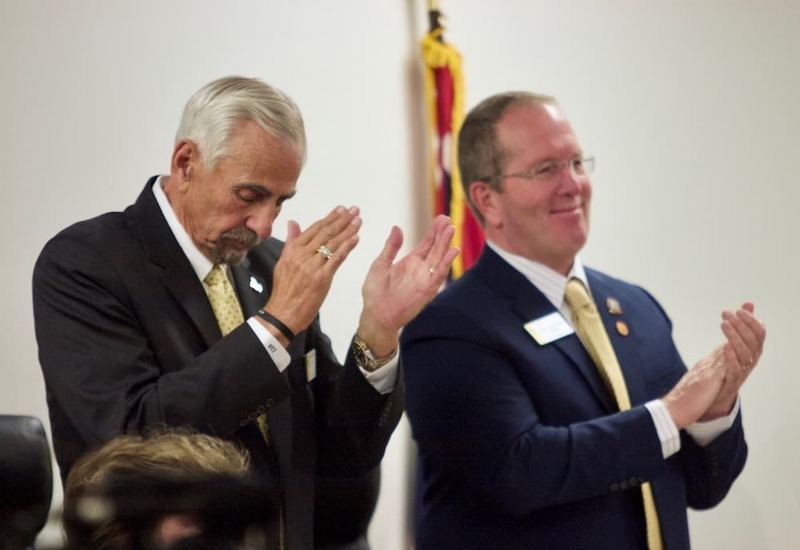 In November, Republican lawmakers caucused in Casper and elected him speaker. He had never held a chamber leadership position before. “If that’s not totally unprecedented it’s been a real long time,” said Rep. Hans Hunt (R-Newcastle), who was House Majority Whip at the time. Charismatic, perhaps, but Harshman was not always the statesman some see him as today. For one observer, it was that ‘hard headedness’ noted by Peterson that stuck out during Harshman’s early years. “He was a tough guy when he came in to the Legislature, and that changed and I think changed for the better,” said Chris Boswell, recently retired from his position as Vice President for Governmental and Community Affairs at University of Wyoming. Boswell has spent decades in the halls of the Legislature in various capacities — from lawmaker to gubernatorial chief of staff to agency head to university lobbyist. Over the years also came an increasing mastery of the state’s budgets. Peterson first worked with Harshman during his time on the Senate Appropriations Committee, when Harshman sat across from him on the House side. To understand Wyoming’s budget well enough to envision and sell structural changes to it, one would have to be. Opening the Legislature’s fiscal databook, which outlines how incoming revenue is distributed between various accounts, is like opening the door to an old attic. There are spiderwebs everywhere. The “summary flow chart” is a tangle of thin lines — cobwebs in an attic corner — between the state’s 12 revenue sources and 17 principle destination accounts. Dig deeper and the complexity only grows. While the lines in the summary flow chart go only one way, lines on a chart describing the state’s $7 billion Permanent Mineral Trust Fund change direction depending on investment performance. In a good year money might tip out of one account and into another. In a bad year it won’t. For many — from lawmakers to reporters to citizens — the entire system seems to be an unnecessarily complex and opaque way to manage public money. “It’s like a Jackson Pollock painting or a Rorshach test,” said Mary Throne, former House minority floor leader and current Democratic gubernatorial candidate. Throne spent some of her time in the Legislature working with House Revenue Committee Chairman Mike Madden, trying to push the House to rely more on investment earnings from its various trust fund accounts. She failed, she said, largely because lawmakers were uncomfortable with thinking of capital gains as a reliable and predictable revenue source. At the time, Harshman was sided with those House members who opposed the idea. He talked about it with reporters. “For 12 years I argued against all of this,” he said. “I wanted to save, save, save. Mary Throne and I man …” he said, knocking his fists together like two rams butting head. Despite the disagreement, Throne said, Harshman was among the few in the House who understood the thinking behind her and Madden’s goals. Compare that to the “endless hearings, debate and agony” of the Joint Revenue Committee, Boswell said. In the months between the 2017 general session and this year’s budget session that committee met eight times, a high number for a legislative committee, working on an ambitious and ultimately largely fruitless effort to find hundreds of millions in unpopular tax ideas. In the past, the lack of budget understanding also has served another purpose for conservative legislative leaders, Boswell said. If the majority of the Legislature didn’t understand where the money was then they wouldn’t know how to spend it. But Harshman has begun to turn that tradition on its head. Harshman had a television screen mounted in his office and connected to his computer so he could display charts from the fiscal databook onto a bigger screen for his audience — whether lawmakers or reporters. He was quick to tell the latter that the television screen had been found in storage, and wasn’t paid for by taxpayers. And even he admitted that the lectures might still be lost on many of his colleagues. “Not everybody’s interested in this and I think in fact most aren’t,” he said . Harshman developed catch phrases as the session wore on, perhaps to reach the less fiscally inclined lawmakers. “Trust your trust funds,” he said with increasing frequency in interviews and on the floor. It was, after all, the “most conservative trust fund in the world,” he would say. The slogans, the television screen, the holding forth about new philosophies for boxes and lines on charts wore on some senators. Some appeared to mock Harshman’s efforts. “The speaker has been hauling people into his office for his multimedia show like a timeshare salesman for weeks now,” said Sen. Bruce Burns, the outspoken Senate Appropriations Committee Chairman. Harshman’s salesmanship seemed to be effective though. On the Senate floor, frustrated by the House’s refusal to compromise, Burns later referred to a “cult-like” unity in the opposing chamber. Harshman’s consistent foil for the last two years has been the hardboiled Senate President, Eli Bebout (R-Riverton). Bebout was a former Speaker of the House himself, and the first Wyoming politician to hold both positions. There were times when the tension spilled out into the public sphere. Bebout assigned a Harshman bill — one that sought to guarantee some investment earnings from the Permanent Mineral Trust Fund for school construction and maintenance — to the Senate rules committee. That’s a panel composed of Bebout and his top lieutenants. Harshman sat before them to present the bill on March 6. 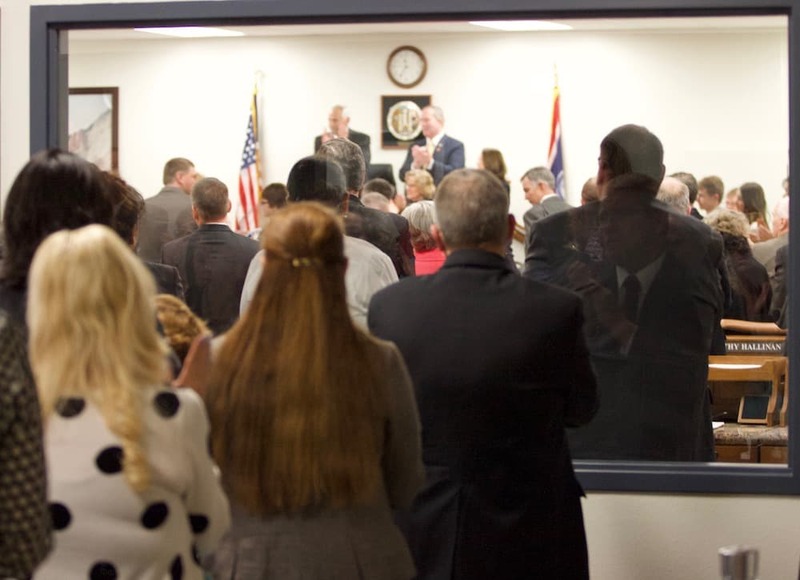 Though it would be one of only a few times during the session that the two men would debate publicly, there was no one in the room besides the lawmakers, a reporter, a clerk and a staff attorney. Senators and the Speaker met in a large conference room, hunched in the middle of the empty space, separated by the width of a folding table. Bebout agreed with the concept of guaranteeing more investment income, but did not want it reserved for school construction. 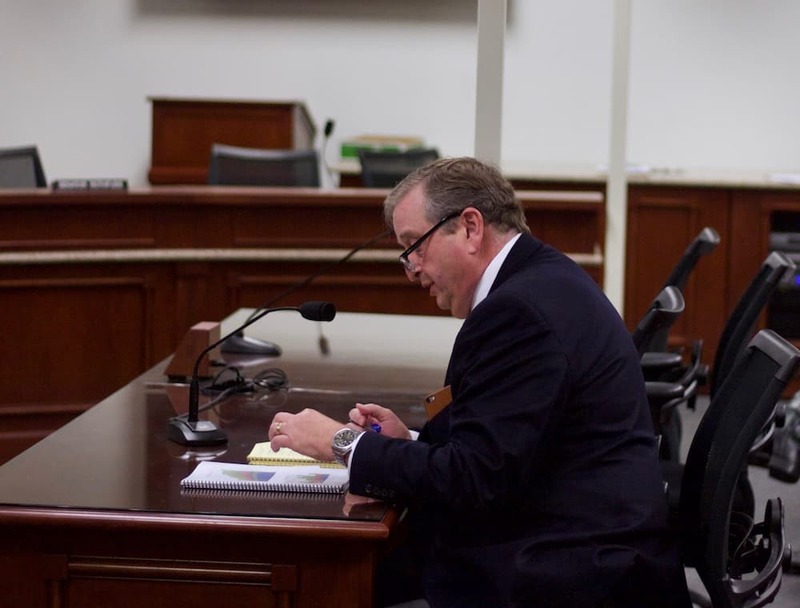 Instead, as Bebout had said throughout the session, the money should go into the general fund where lawmakers would have to vote each year on how to spend it. But while discussing an idea to build cash up in a reserve account — an idea Harshman attributed to Sen. Bill Landen (R-Casper) — the men appeared to debate more than technical differences. The rules governing committee meetings fell by the wayside as the two men spoke over each other. “I thought it was a pretty cool idea what Landen said, so if you did that…” Harshman said, before Bebout cut in. “One of our senators is agreeing with you?” Bebout said. “Well this wouldn’t be used for projects first, if we used some of this…” Harshman continued. “We could do that right out of LSRA [the Legislature’s savings account],” Bebout said. “Is that what Drew’s thinking about?” Bebout asked. “He’s looking, he’s always thinking,” Harshman said. Perkins (R-Casper) stepped into a pause in the back-and-forth. “I’m always looking for something that’s good for Wyoming,” he said slowly. “I hear ya,” Harshman said, and the men turned back to working on details of the bill. But another exchange surfaced later, as the men discussed how much the state should prioritize major maintenance. Bebout brought up his business experience. “I will tell you, in the real world that I live in, that [Senate Vice President] Von Flatern lives in, that Senator Perkins lives in…” Bebout said. “Hey, I’m in the real world too,” Harshman interjected. “I got told a lot … ‘ah, real world,’” he told his chamber. “And I think it’s important to kind of realize … all of us have our own little bubbles, and we have our own ‘real world.’ … I’ve never been a sheriff, I don’t know what that’s like. I’ve never been an attorney, I don’t know what that’s like. But after the session, Harshman complimented the Senate president, and said he and Bebout had as much in common as they did in differences. “We’re both small-town kids,” he said. Bebout went to high school in Shoshoni. Saving education now at the cost of its future? In the heat of the session, it’s difficult to understand what changes were actually made. Permanent trust funds with billions of dollars in them like the PMTF or its equivalent for education — the Common School Permanent Land Fund account — earn hundreds of millions of dollars over time, whether through investment earnings or simple bank interest. What Harshman wants to do, and what Throne tried to do in the past, is increase the amount to which those accounts’ earnings can be used to fund state government and education. Compared to the boom-and-bust cycles of the energy industry, Throne said, investment earnings can be considered fairly stable. The trust funds hit their mark on investment earnings most years — eight out of 10 is the estimate used by some of the state’s economists and many lawmakers. Others, including Harshman, say nine out of 10. Over the years, lawmakers have created some accounts that fill up during good years, guaranteeing money will be available in the off years and allowing lawmakers to count on it. The more money the Legislature uses for spending, however, the more investment earnings the state has to put into reserve accounts to guarantee it. Such a shift escalates the risk posed by a market correction — if the state’s spent its winnings, it’s lost that cushion when the markets turn and Wyoming starts losing. A big loss could then affect the amount of money in the trust funds themselves. And that’s what worries Sen. Ogden Driskill. Driskill (R-Devils Tower) serves on the Senate Appropriations Committee. He doesn’t disagree with everything Harshman pushed, he said, but much of it worried him. Take “Harshman’s statement of ‘trust your trust funds,’” the senator said. “As long as the markets stay good and everything’s solid … he’s right and we’re going to be fine.” But with changes made this session the state’s trust funds will now grow more slowly. That comes both through the guaranteeing of more investment earnings for spending, plus the Legislature’s decision to shift large streams of both mineral severance money and state mineral royalties away from trust funds. With slower growth, the funds’ vulnerability to market dips increases. Wyoming has a cautionary example for this. UW has a trust fund called the “Higher Education Excellence Endowment” fund. Earnings from the fund were being drawn on each year, and the investments were poorly managed, observers say. In 2008, when the bottom dropped out of markets, the fund went “upside down.” It was no longer making enough money to meet its spending guarantees. Some of UW’s most esteemed professorships were paid for out of that fund, and eventually they became at risk. Since then, the Legislature has had to add money to the fund to restore it. Lawmakers did so again this year. Driskill pointed to another concern as well. Money the House might think they’ve discovered and can use to protect education was always going somewhere. Take mineral royalties from state lands, for example. At some point in time lawmakers put an $8 million limit on the portion of state mineral royalties that education accounts would receive. The rest would be shoveled into the Common School Permanent Land Fund, where it could not be spent. The Wyoming Constitution requires two thirds of state mineral royalties to be saved and invested, the other third was free for spending — until lawmakers installed the $8 million limit. The answer that came back was $42 million more a year. “I was like, what?” Harshman said. The money will now be captured and spent on school construction. After all, education supporters pointed out, much of the state’s mineral royalties come from land grants given by the federal government when Wyoming achieved statehood, expressly for the benefit of public schools. But now, money that would have benefited the education funding trust fund in the long term will be spent maintaining schools in the short term. “If that’s what our public wants is to go ahead and spend it today, then I’d suggest it’s not the end of the world,” Driskill said. But he worries that the public doesn’t comprehend the ramifications of the decision. Add the $42 million up over years, then compound it by the bank interest and stock market winnings that will never be earned, Driskill said. You’re quickly talking about hundreds of millions of dollars that won’t be in education’s trust fund down the road, Driskill said. Driskill repeatedly said that Harshman has a remarkable grasp on the state’s budget. 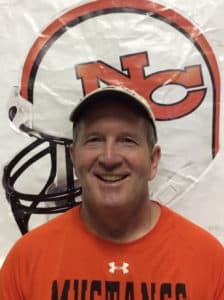 “He fully understands the entire thing,” Driskill said, and “he is upfront with what he’s done.” But that doesn’t mean that everyone else understands it. In December, Harshman confirmed to the Casper Star-Tribune that he was mulling a run for governor. This week, he said he was still pondering that decision, even as campaigns are beginning to ramp up around the state. “A lot of people are talking to me about it still,” he said. Harshman may not be done with the House, either, he said. It’s a tradition that the Speaker of the House not serve twice. 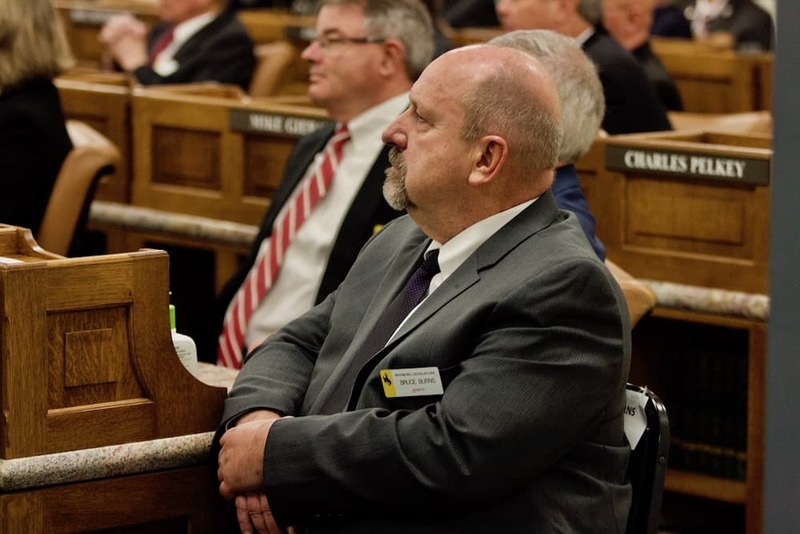 According to tradition House Majority Floor Leader David Miller should be next in line for the Speaker’s chair, as Miller pointed out in an interview last week. “That’s the traditional way is the majority floor leader isn’t even challenged,” Miller said, before promising changes and a tougher fiscal attitude. “It would be quite a different session next go around if I was Speaker. 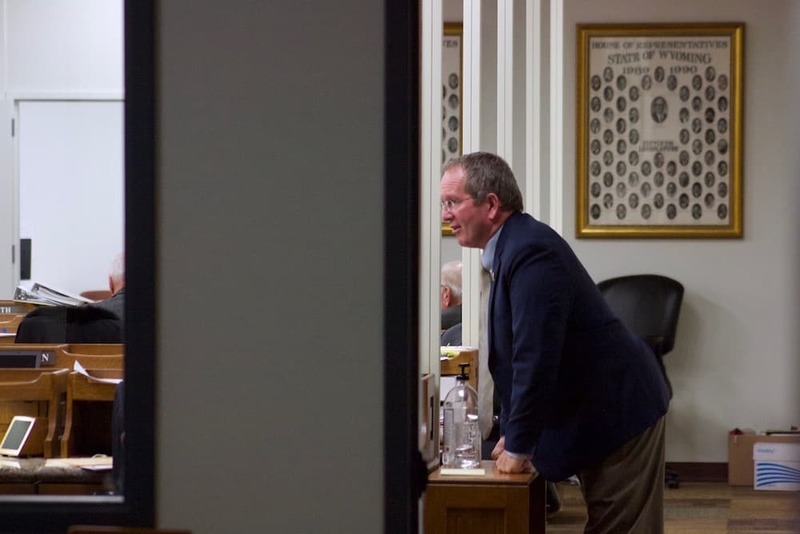 Harshman believes that even if he isn’t speaker, increased awareness of the state’s trust funds and the efforts of the House members who bought into his ideas will carry the discussion he’s started forward. Lifting the veil from the state’s budget was the most important legacy of the session, he said. “There are more people that know more about this than I think at any time since I’ve been in the Legislature,” he said. Other lawmakers worried about more immediate concerns. On April 19, legislative leadership from both chambers will meet to select topics for committees to focus on over the next eight months. Last year, that meeting took place during the heat of the session and ended badly. Senate members walked out during a debate over whether the Joint Revenue Committee would consider new taxes. 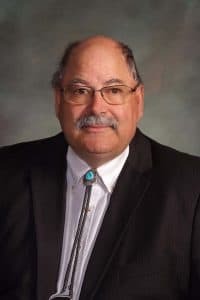 Several lawmakers interviewed this week referenced an editorial penned by Jim Magagna, a longtime lobbyist for the Wyoming Stock Growers Association. Magagna called for more unity in the Republican supermajority in the Legislature. While decorum may improve after a cooling off period, the debates of this session aren’t going away. Not only does Harshman not yet share concerns about overextending the trust funds, but he thinks there is likely room to make more capital gains available for spending. “I think we can do a little more than we’re doing,” he said Thursday. Today, the Legislature guarantees the annual equivalent of five percent of earnings from the Permanent Mineral Trust Fund, based on an average of what the fund earns over five years. When Harshman started in the Legislature, he said, they guaranteed eight percent. But last year, the Legislature passed a bill that would begin to reduce that guarantee. By 2022 the guarantee is slated to drop to 4.5 percent. Harshman voted for that proposal, but now he appears to be reconsidering it. “I think five is a pretty safe number,” Harshman said. Each percentage point equals around $80 million a year, he said. That’s $80 million to stave off cuts to state government or education. It’s the equivalent revenue of a half-cent sales tax — something that would never survive the rabidly anti-tax faction of the House, which Harshman couldn’t control or perhaps doesn’t want to. Great journalism. This is the 4th estate working hard for us. Great job Andrew. You got it down. Excellent story that gets deeply into what the speaker accomplished this year and how he did it, whether you agree with him or not.